"Dr. Clarke and his team have been excellent with our two boys. Dr. Clarke gives practical and experienced advice, helping us make smart decisions when further treatment is needed. Robyn Riley is the best lactation consultant that I've ever been to - patient, practical and very encouraging. A great practice for Dallas-area families!" This sheet has been designed to help you with questions, which may arise when our office is closed, and to help distinguish between what is an urgent and non-urgent medical problem with your child. Our doctors are always available for urgent questions. However, please respect the doctor’s family life and hold non-urgent calls for business hours; your consideration is greatly appreciated. To schedule an appointment, call during business hours. Review this information before calling the doctor to determine if a call is required. For advice related to issues not covered in this handout, visit the “Children’s Health Library” link on our website. Also, check the availability of an insurance company operated after hours triage service. This number may be found on the back of your insurance card. The following information is divided into topics based on symptoms. Fever is a normal response by your body to various causes (i.e., infections, vaccines). Fever can make a child feel uncomfortable, but it can be beneficial; fever helps the body fight infection, turns on the body’s immune system, and may help shorten the course of the illness. Our group defines fever in a child older than 3 months as a temperature ≥ 101ºF. There are many ways to take temperature including under the arm (axillary), rectally, orally, in the ear, or with a temporal scanner. Keep track of your child’s actual temperature and how you take the temperature. If your child has a fever, we recommend treating the fever only if the child is uncomfortable. In most cases the anti-fever medicine (i.e., ibuprofen (Motrin®, Advil®) and acetaminophen (Tylenol®, Feverall®) will only bring the child’s temperature down 1º-2º degrees. For example, if your child has a 104ºF temperature, we expect the fever to drop to 102º-103ºF with medication. As an adjunct to fever reducers, you can give your child a tepid (water temperature of 85º-90ºF) bath. In certain circumstances, fever can be a sign of a more serious illness. Notify the on-call physician of your child’s fever if it meets one of the criteria listed below. Fever reducers are only designed to make your child more comfortable. It will NOT stop your child from having a fever. On average, fever reducers take up to one hour to work. Acetaminophen can last as long as 4-6 hours and can be safely given at any age. Ibuprofen can last as long as 6-8 hours and can be safely given to children ≥ 6 months of age. With over-the-counter cold medicines, avoid preparations, which also contain acetaminophen or ibuprofen in order to minimize the chance of overdosing on a fever-reducing agent. When your child receives vaccines, it is quite common for him/her to have fever, discomfort, swelling and redness around the injection site. For more information about shot reactions, consult the vaccine handout you received in the office. In most cases shot reactions are not emergencies. In the best interest of a sick child, an examination should always be done first before any medication, if warranted, is prescribed. If you are concerned about your child’s illness and think your child cannot wait until the morning to be evaluated, take your child to an emergency room or urgent care center. Should issues arise with a refill request, please call during regular business hours when we are best able to handle these requests. There are many illnesses that will cause vomiting and/or diarrhea. These illnesses are commonly referred to as viral gastroenteritis. In most cases, children do not need to be seen immediately for these symptoms. The most important thing you can do is keep your child hydrated. The best way to keep small children (< 3 years old) hydrated is with an oral rehydration liquid (i.e., Pedialyte®). Older children can take water, flat ginger ale, or Gatorade®. Avoid red or green colored drinks for it may artificially make the vomit appear to be bloodstained or bile-stained. Also avoid drinks high in sugar such as apple juice. If your child has begun to vomit, let him/her rest for 1-2 hours to allow the stomach to settle then start with small sips of liquids (i.e., 5cc every 5 minutes for 1-2 hours). Some children will continue to vomit but in most cases the frequent small amount of liquid will keep them hydrated. As with vomiting, diarrhea is most often caused by a viral gastroenteritis. The key is to keep your child hydrated with water. Avoid juices (especially apple, pear, or prune juice) or any drinks high in sugar for these types of drinks can worsen diarrhea. For formula-fed infants, continue normal feeds. In older children (> 1 year old), give more starchy foods (rice, bread, plain pasta). In most cases, diarrhea is not an emergency and can be addressed during office hours. We do not recommend any medication to stop diarrhea. Such medications may prolong the illness. A cough is a normal response to most upper respiratory infections. With a few exceptions, you can treat your child at home. Please refer to our website for more information. Medication, if warranted, will be prescribed after your child has been evaluated. As with a cough, children may suffer from nasal congestion or a runny nose with colds. Nasal congestion is not an emergency. Visit our website for more information. In general, both earaches and sore throats are not emergencies but may need to be seen in the morning. Antibiotics, if warranted, will be prescribed after your child has been evaluated. If you feel that your child cannot wait until the morning to be seen, then take him/her to an urgent care center. In the meantime, pain relievers and warm compresses may provide comfort. For an older child with a sore throat, try having him/her gargle with a teaspoon of salt dissolved in warm water for temporary relief. If your child’s sore throat includes other symptoms: excessive drooling, severe difficulty swallowing, difficulty breathing, or being unable to open his/her mouth fully. If your child’s earache includes other symptoms: stiff neck, loss of balance when walking, or redness and swelling behind one ear in comparison to the other ear. In most cases, rash or unusual skin changes are not emergencies and cannot be diagnosed over the phone. If you are concerned about a rash, please call during regular office hours. If your child has recently started a medicine and develops a rash, stop the medication and call our office in the morning. Conjunctivitis is commonly referred to as pink eye. Pink eye does not require immediate therapy in most cases. If your child has developed redness in the eye or discharge from the eye, please call our office during business hours. Until your child is seen, you can treat the eye with warm compresses or artificial tear drops (available at most drug stores). The teardrops can be used as often as needed to irrigate away the discharge. Remember, conjunctivitis may be contagious, so wash your hands after caring for your child. Medication, if warranted, will be prescribed after your child has been examined. 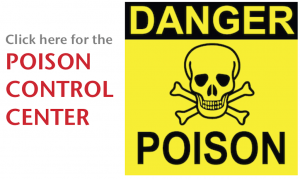 Please call the poison control number 800.222.1222 for all accidental ingestions. They are best equipped to answer all your questions. Please refer to our website for further information. In general, if your child sustained a severe injury, you will need to bring him/her to an emergency room or urgent care center. A diagnosis can only be made after an evaluation of your child. The on-call doctor in most cases will only be able to give recommendations as to whether your child needs to be seen immediately or if it can be addressed during our regular hours. Constipation is not an emergency and can be addressed during office hours. To minimize the occurrence of constipation, provide a well balanced diet to your child and make certain your child is well hydrated.